Ellen Martin has hit the mark by writing a concise and wise “must read” for all parents. 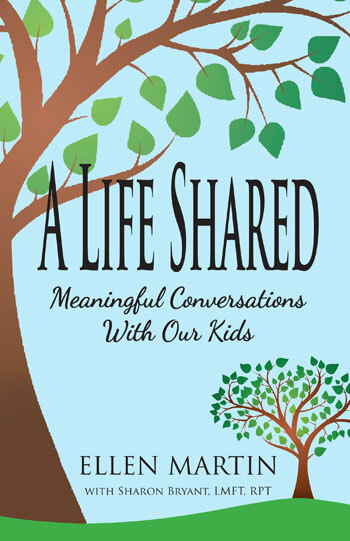 In A Life Shared: Meaningful Conversations with Our Kids, she challenges parents to take one small step toward reaching the hearts and souls of children through everyday conversation. 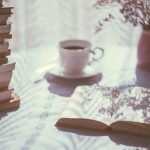 This author lives a full and busy life raising five boys as well as wearing several other hats, so she knows what exhaustion and a full schedule looks like. Even though she faces her own obstacles to actually living out what she proposes, she models how to escape common ruts and chooses to transform these obstacles into opportunities. I am a licensed pastoral counselor, play therapist and spiritual director. My days are spent listening to pains from childhood or current life. Most of the time these hurts are relational. I recently had a boy tell me that his friends at school were his “real family.” This came about as the result of both parents being involved in high stress professional careers who just didn’t pick up on the signals that he was missing them; he was brought to me for “acting out” behavior. I wish you could have seen the expression on his face when I declared that he was not the problem, it was a family problem. There began the family therapy sessions where we spoke truth together, the parents listened intensely, and relational repair was initiated. This same boy a few months later dropped his connection with an unhealthy group of kids and settled back into a healthy family dynamic. Ellen’s book speaks well into family scenarios similar to this as well as addressing many other communication issues commonly encountered in families. A critical point of the book is encouraging parents to pay attention to the questions children ask and to notice their responses. The undergirding logic is to be present and “in the moment” with our kids. She defines “conversational practices” as becoming “part of the family culture, a relational dynamic” and as choosing conversation as a practice so that “meaningful conversation becomes possible at any time” (p.18). Since conversations with children often contain many road blocks, how can parents overcome them? As a mom of all boys she is familiar with listening to boy subjects of which she has little interest or knowledge. Teaching and modeling healthy conversation skills and boundaries are addressed as she acknowledges that it is impossible for her to be available to all of her boys 24/7 and that some conversations are just between herself and her husband. As a child therapist and past teacher, I can affirm that Ellen understands child development. She is a kid watcher who recognizes that our conversations change as our children grow and mature. She knows that every child has his or her own unique personality, temperament and ability. That is to say, conversational styles may vary between us and each of our children. Ellen recognizes the roles of parents as parents and discourages parents away from the posture of being “friends” with their children. Underneath this philosophy is the building of mutual respect between kids and parents, but also the recognition that that parents are the leaders of the family. The other true beauty of this book is the fact that Ellen never shies away from the hard conversations. As parents, we often neglect talking to our kids about the painful or intimate things of life. If we fail to model how to do this for our children, they have to learn how on their own, or worse, they replicate our inability to talk about deep issues. To counter this, she suggests four tools and then illustrates them using examples from her own life. For example, Ellen describes telling her boys about their grandpa’s cancer, her miscarriage, and changes that her boys should expect during puberty. Children should be talked with, not at. It is not necessarily what we say as parents but the way we say it that communicates. Asking questions as questions and not as accusations is critical to opening up a conversation rather than shutting it down. Yes, our children are children but we must always remember that they are people with feelings too. By making certain that all of our conversations are motivated by love, we will contribute to creating a lifelong bond and openness between ourselves and our kids. This book encourages all parents to start right where they are in their current family conversations. This isn’t a “tackle the whole mountain of dishes at one-time” type of book. Each chapter is broken down with thought provoking questions written by an astute marriage and family therapist. Then there are simple “washing one dish at a time” steps a parent can take to try just one new thing. This book is not meant to overwhelm or lead a parent on a guilt trip; it is gentle and manageable. Most of us really do not know how to listen deeply, compassionately, and empathetically to connect well. Rather, we open our mouths and speak without a moment’s reflection as to what our message really conveys. Often the bulk of my work is teaching people how to lovingly speak with each other in ways that promote connection rather than sever bonds. When I read this book, I was overjoyed to have such a real-life approach to communication to share with my clients. It is refreshingly written from an authentic and vulnerable Christian perspective without being a superficial conglomeration of commentary on countless bible verses. Ellen is not afraid of publically sharing her own mistakes and she does not hold up an image of a perfect parent as she knows that is an unattainable goal; part of her own theological understanding is recognizing God as the only perfect parent. If we made conversation a priority in our families, I can only imagine that our homes would be more peaceful, full of joy and laughter, and love. I will be recommending this book to my clients, giving it as a gift to new parents, and sharing it with parents who feel they can’t connect with their teen. You can buy it here! I wish I had read this book while my children were still small. Even with children who are 20 and 16, I’m trying some of Ellen’s tips to have more meaningful conversations with my children and share our lives in a deeper way. And now this book is the gift I purchase for any expecting parents. Thank you Margaret! A gift for expecting parents, how lovely! Glad some of the tips help your parent- child relationships continue to grow.